The “more” link returns a 404 “Not found” error. PC vistors to Boltbrowser.com see a similar message. Other pages on the boltbrowser.com domain like boltbrowser.com/forum and boltbrowser.com/download also return “Not found” errors. The Bolt app has been removed from the Android Market as well. The message suggests that Bolt may continue as a paid app but I’ve been unable to find any information about that and the sudden closure of the Bolt Forum and help pages suggests that a paid version is not imminent. Proxy browsers like Bolt are an important part of the mobile Web infrastructure. They allow old and low end feature phones to browse virtually the entire web and cut data traffic by up to 90%, which speeds up page loads on slow networks and saves money for users on metered data plans. Bolt was one of the big three of proxy browsers, along with Opera Mini and the UC Browser. Bolt was unique in that in addition to reformating and compressing Web pages on the server, it also transcoded Flash and HTML5 video into a format that most phones could display. Bolt is a product of Bitstream Ltd., whose main business is font tecnology. Bitsream has been posting losses for while and is in the process of merging with Monotype, another font foundry. As part of the merger, Bitstream’s non-font assets, including Bolt, are being spun off into a new company called Marlborough Software Development Holdings Inc. whose first order of business seems to be liquidating the unprofitable browser business. Proxy browsers are supported by selling search engine and default bookmark placements and licensing the technology to handset makers and operators. Transcoding Web content is expensive but transcoding video is an order of magnitute more so, which I suspect made Bolt unsustainable economically. Opera Mini and UC do not transcode video so hopefully they will survive. Opera says that Opera Mini is profitable. I don’t know about UC, which I think is privately held. This entry was posted in Browsers and tagged Android, Bolt Browser, Java ME by Dennis Bournique. Bookmark the permalink. I would pay for the proxy browser. It was the best in terms of data compression. The savings you get on data is incomparable. Oy bitstream if you can’t hosts, then open source the compression technology. We are eager to contribute servers. go to vuclip.com there you can download and playback mobile videos. arre i am currently using opera mini but it doesnt support online video i want to play online video pls come back. 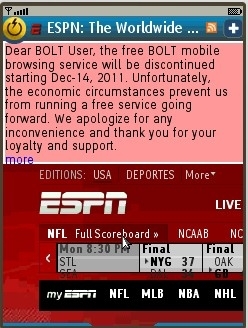 please bring bolt browser back.opera mini and uc are free.why cant you make it free again? this was the best browser i hve ever seen for mobiles. It was much better than most browsers like opera,uc,etc. Its a request tha plz activate the browser. Its ur wish that u charge money for it or run the software free like before. I have heard anything about it coming back. I doubt that it ever will. Please activate, we are frustrated without it. This is much better than other. Bolt browser very helpfull to us. It is a good browser, full version like a mobile pc. Please start again this browser. Plz activate the bolt browser again. it is the best browser than others.